With only a flashlight to guide you, take an after-hours tour of the creepy and fantastical arts of the tomb, in the Museum’s Antiquities and Asian galleries, followed by a walk to the Mummy’s grave in West Cemetery. 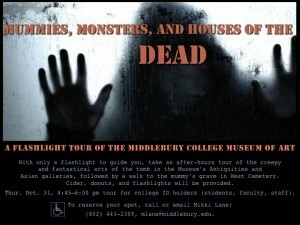 Cider, donuts, and flashlights will be provided. 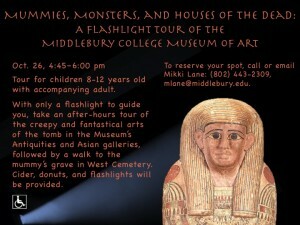 Saturday, October 26, 4:45 p.m. – 6:00 p.m. – This tour is for children 8-12 years old with accompanying adult. 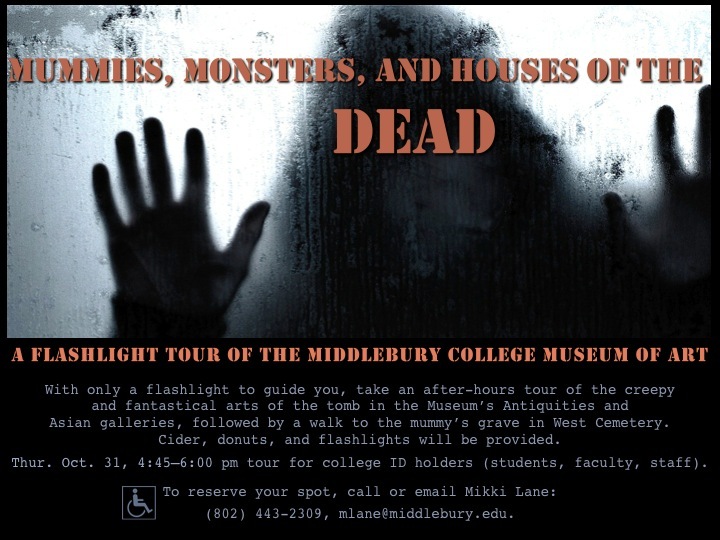 This entry was posted in Midd Blogosphere and tagged Events, For Faculty, For Staff, Grave, Halloween, Mummy, museum, Tomb on October 14, 2013 by Marcia Lane.